Beautiful pumpkins! Jealous! We had zilch. What variety are you growing? This particular variety is called Cinderella. I also am growing Spaghetti, Butternut, Chersonskaya, and a buttercup variety. I have had mixed results. The cinderella is doing quite well and has at least four large squash among the two vines. I think we are going to have more than we can eat…. This, by far, has been my best year for squash. I’m glad you commented on my recent post as I lost track of your blog. I switched over to BlogLovin and could have sworn I ‘brought you along’ when I did. That’s remedied now and I’m following again. 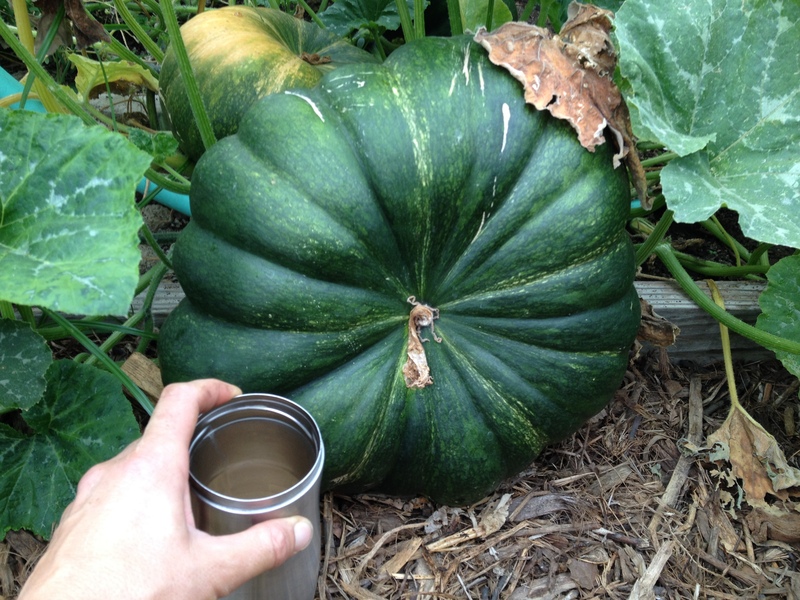 We grew four huge Cinderella pumpkins two years ago. They weighed between 42 and 58 pounds. We could barely lift them. It was fun for one season, but they were difficult for our resident carver to carve into jack o’lanterns so we went back to the carving variety. I’m growing them in EarthBoxes this year, a new experiment, but the squash bugs found them anyway. So far only two small pumpkins. We’ll see how far they go. Wow those were some big pumpkins! How are you liking BlogLovin? I have been thinking about using it, as I would like to better keep track of the non wordpress blogs I follow. I am so glad you found me again! I’m glad I found you too. I also read and left a long comment on your Vegas post (essentially agreeing with everything you said) but my computer glitched and the comment disappeared into the ether. I really like Bloglovin. You can read blogs in the order they were posted or by author. They provide an alphabetical listing of the blogs you follow, making it easy to read and catch up when you fall behind (as I often do). So many great blogs, so little time.